An homage to traditional Scottish imagery, the Green Gem Lion Sgian Dubh is based on the historical Highlander dirk. A silvery rampant lion, much like the one seen on the Royal Banner of Scotland, decorates the textured black handle. Made of stainless steel, the spear point blade is slightly serrated at its back next to the hilt, lending detail and utility to its versatile form. Silver tone bands, engraved with an ornate Scottish thistle pattern, decorate the top and bottom of the hilt, the bottom of which encases the oval shaped, multi-faceted gemstone. The crisscross lines upon the hilt, surrounding the lion emblem, add sureness to this Scottish dirks grip. 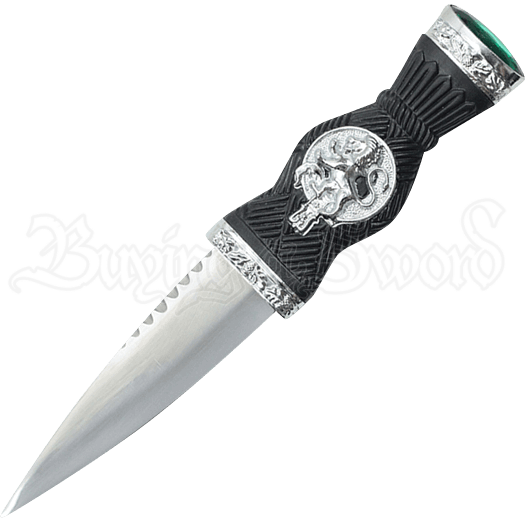 This Highlander dagger comes with a matching black composite sheath, itself adorned with matching silver tone thistle details. Add authenticity to your next historical Scottish reenactment when you accent your outfit with the Green Gem Lion Sgian Dubh. A beautifully designed, historically inspired weapon, this Scottish dagger also makes a fine display piece or gift.